Four off-duty Minneapolis police officers working security at Saturday’s WNBA game at the Target Center quit their (freelance) jobs and walked out, after four Lynx players held a press conferencing denouncing violence committed by and against police, and the entire team wore warmup shirts mentioning the victims of a week of terrible violence. The tragedies had meaning to both teams in the game, which the Lynx won 93-56 over the Dallas Wings. Philando Castile was shot and killed by an officer during a traffic stop in a suburb of St. Paul Wednesday night. The next night, during a Black Lives Matter protest in Dallas, a lone gunman opened fire on police, killing five officers and wounding six other people. 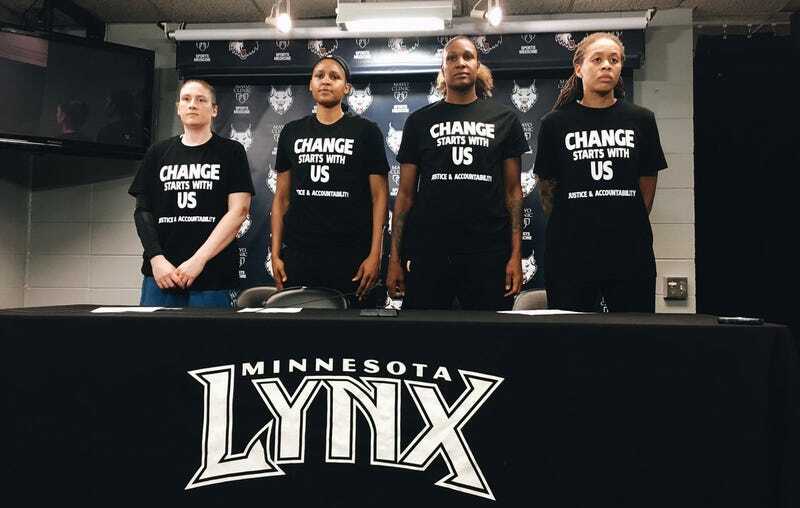 The Lynx players’ shirts read “Change Starts With Us: Justice & Accountability” on the front, and on the back listed the names of Castile, Alton Sterling, a Dallas Police Department emblem, and Black Lives Matter. The four officers left the arena and took their names off a list to work future games, according to their union head. Lt. Bob Kroll, president of the Minneapolis Police Federation, the union that represents rank-and-file officers, praised them for quitting. “I commend them for it,” he said. Lt. Bob, that seems pretty disrespectful of the slain Dallas cops the Lynx players honored on their shirts and in their comments, but what do I know? Moore denounced the “senseless ambush” of Dallas police. The Target Center also hires private security, so this MPD walk-out will not affect future events.